In this chapter, we’ll display our game scores as a graph. Please download the Try4.zip file by selecting the following link: Try4.zip. Unzip the contents to the C:\Curl directory. This is the working directory for all the examples and exercises contained within this tutorial. Note: If C:\Curl has not already been created, you can create it now. Close the Try 3 project and then, from the IDE 'File' menu, select 'New Project'. 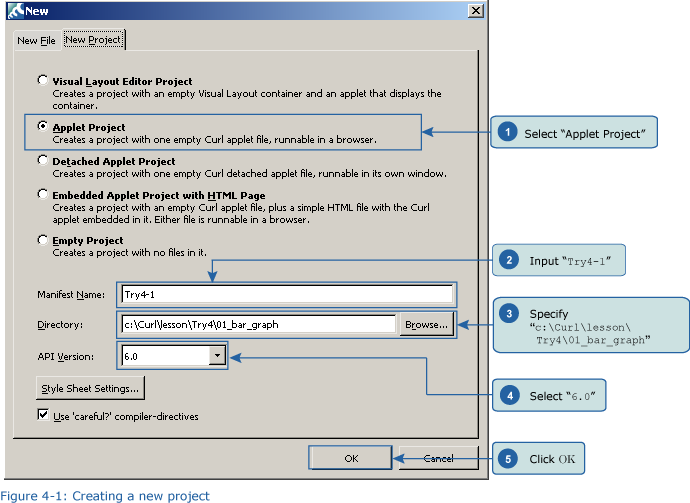 In the 'New Project' dialog box, select “Applet Project” (1), input “Try4-1” (2), specify c:\Curl\lesson\Try4\01_bar_graph in the “Directory” field (3), set the API Version to 6.0 (4), and then click OK (5). Next, we’ll input the program. 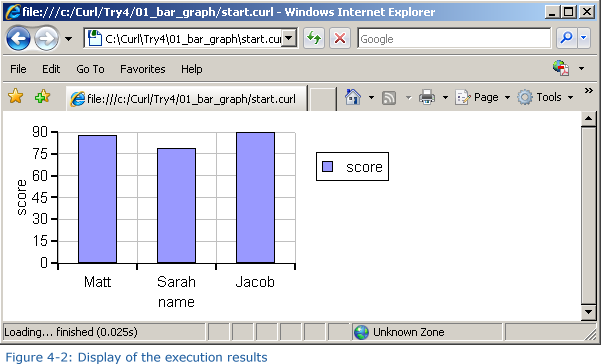 You can copy the program code below or use c:\Curl\Try4\01_bar_graph\start.curl and then paste it into the editor in the IDE. After inputting the code, save the file, and then execute the program. The following result will appear in your browser.